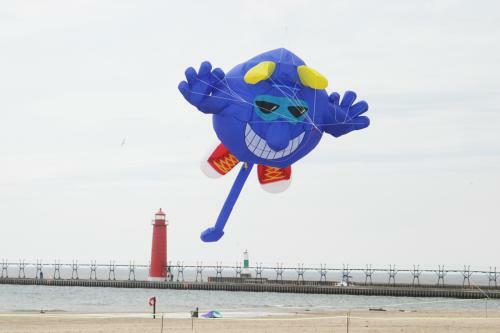 From May 21-23, my husband and I attended our first kite festival, The Great Lakes Kite Festival in Grand Haven, Michigan. The weather had it’s ups and downs (typical MI), but overall, my husband, Jay, and I really enjoyed ourselves. 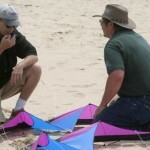 We arrived Friday morning to attend a fighter kite building seminar. 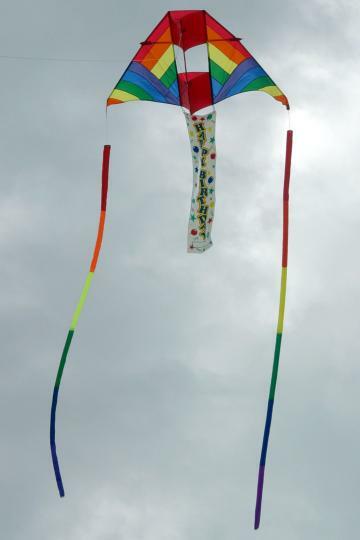 As a storm built outside the building, I was surprised how easy it was to build my first kite. They guys from the Red Bandana Gang taught us and shared a few of their sneaky tricks for competition. We even got to see them put their skills to work at an indoor fly that night and a competition later in the weekend (This was the only competition held at the festival.) They totally inspired my husband, who, I’m afraid, my become an addict. *wink* The guys gave him some material to start with, and he has been scouring the internet for designs ever since we came home. 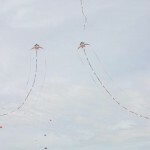 With our new kites in hand we headed toward the lakefront to find our hotel. We were staying right across the street from the state park. 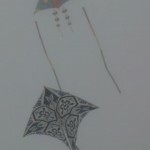 After check-in, we headed straight for the beach with a couple of kites. 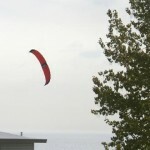 It was great flying in smooth winds, although a little chilly. 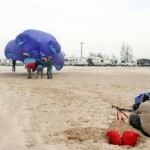 More people started filling the beach, so we brought our kites down and wandered around a bit. 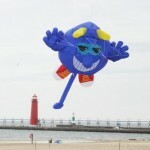 Jay likes flying inflatables and I have been trying to convince him for some time to make his next major purchase the Blue Meanie. After seeing it flying in person, I have him convinced. 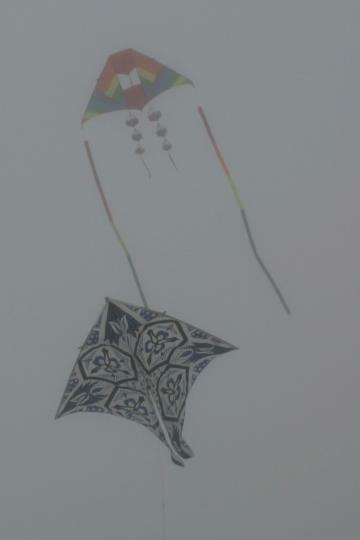 *big smile* Seeing kites in person has to be one of the better parts of a festival. 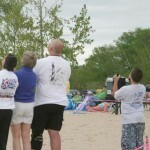 Even looking through Mackinaw Kites’ tent, I saw many kites I had only seen pictures of. Friday’s biggest highlight was the indoor fly. I was amazed. I had heard of indoor flying, but had never seen it. Dual lines, quad lines, single lines, it didn’t matter; there was someone there who could get them zipping around the gym. Sam Ritter, Lam Hoac, Lee Sedgewick, etc. I enjoyed them all. The Saturday morning winds really started blowing. 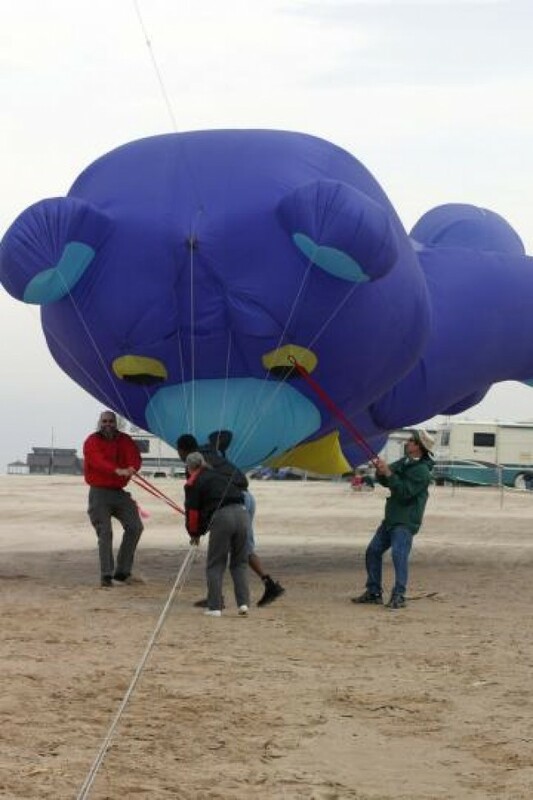 We happened to be down by the inflatables field when David Gomberg was trying to get a blue bear up. It didn’t get far when he said it was unsafe. 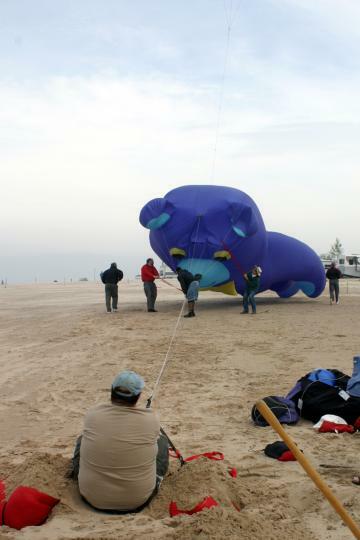 The Gomberg’s put one guy on the end holding the anchor strap with the advice, “If the kite goes, don’t go with it,” and the remaining 5 people wrestled the big guy out of the sky. The afternoon winds died out. The flyers on the demo field broke out the ultra-lights, amazing part of the crowd. Some of the crowd, that was grounded due to lack of wind, walked the shoreline or built sand castles, while others decided it was time for their picnic lunches. 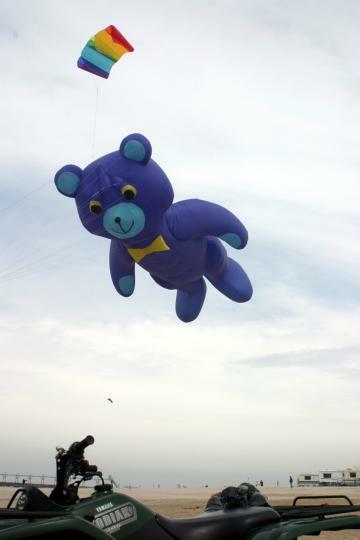 My husband and I wandered up to the inflatable kite area of the beach where they were begging for wind. 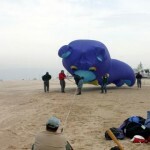 We were given some tips and tricks about flying the giants by a nice guy from Holland, Michigan. (He said he probably wouldn’t remember my name, and now I don’t remember his.) 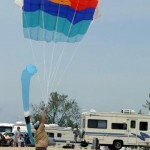 We shared stories with inflatable fliers for a while and headed to the demo field. Man, are those people skilled! I eventually got a little stir crazy. So, being inspired by Friday night’s indoor fly, I took out my Ozone for the first time in Zero wind. (Prior to this I have always had at least a slight breeze.) To my thrill, I was able to do a decent job. I couldn’t really trick it, but I could fly. After a food break back in the motel we could see the wind had picked up again. So we headed back across the street. By the time we got over there, fog was rolling in. 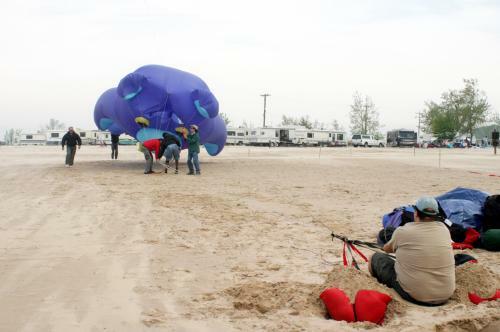 People were leaving the beach, but we had to fly with some of the other die-hards. 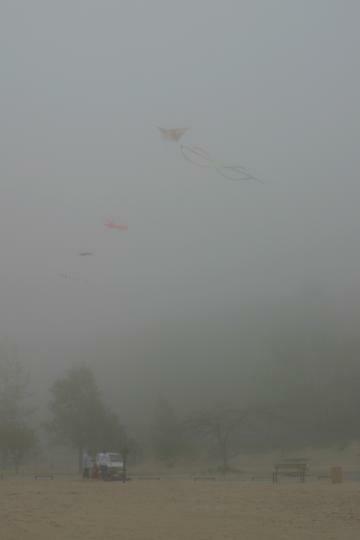 It was cool seeing other kites peeking in and out of the fog. By the time the night fly came around, the fog had cleared. 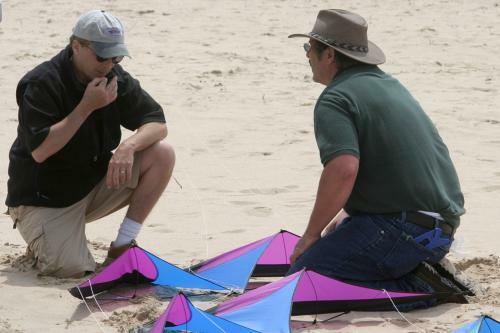 So, with a great idea for lighting a rotating box kite, I headed back to the beach. Notice, I said “idea,” because I never had a chance to see it work. All the wind was gone again. 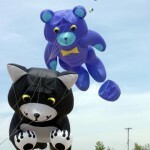 A few people tried getting kites up and kids walked around wearing blinking lights or glow-sticks, but for the most part, it was a bust. Sunday had its adventures for me. My husband took me to the beach and told me to sit in the chair and watch. So, I watched him put his DC together and attach several things to the back, but right as he was getting ready to launch, high winds picked up and actually broke one of the thick wooden dowels. He was devastated. I couldn’t figure out why he was so upset, after all, getting a replacement wouldn’t be a problem. As we stood under the shelter to protect our skin from being sand blasted, he showed me his plan. I felt so bad for him. We asked all over if anyone had some kind of replacement, but to no avail. 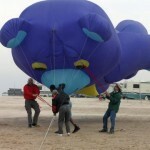 We eventually decided to run to Mejer and buy some duct tape-not a permanent solution, but it would get him in the air. So, as he held the stick together, I tightly wrapped it with tape and we headed back to the beach (in calmer wind) to try to achieve what he was hoping for that morning. 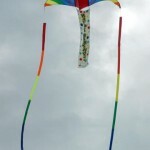 His kite did go up with a tube tail on each side and a “happy birthday” bannerin the middle for me. It was so sweet, but even better was to see the smile on his face as he saw his plan finally work. 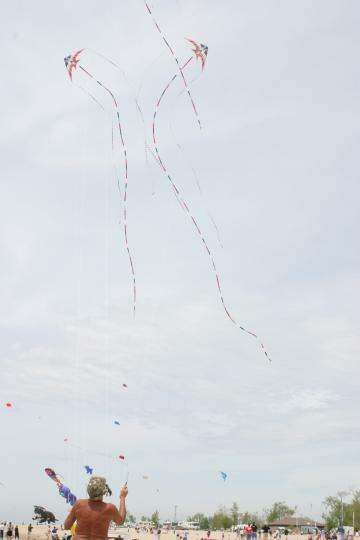 The kite did fly a little to the right, because of the duct tape, but still steady until.  . . a dragon kite nearby started gaining altitude. 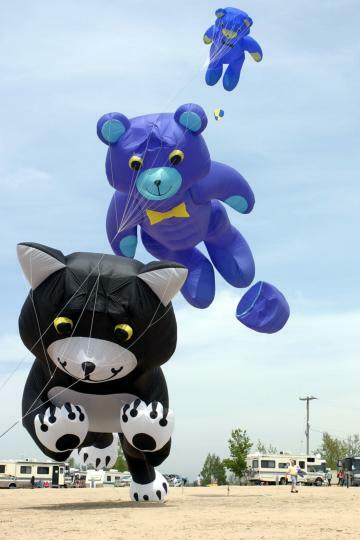 It’s line caught one of the DC’s tails and sent the birthday kite into a nose dive with no chance of recovery to the other side of the building. My husband tossed me the line and went running. I waited for him to come back around the building to tell me it was okay. A million terrible thoughts were running through my mind. After several tense moments he was back. “Is anyone hurt?” I asked. No, no one was around there. Wow, that was lucky. “Oh no, what about all the vehicles?” Whew, it fell just a few feet in front of them. 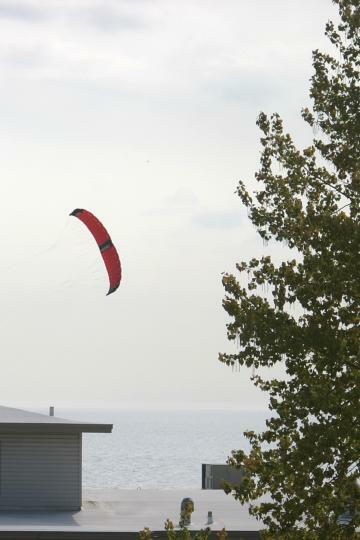 He went back around to get the line off the kite so I could reel it back in over the roof. 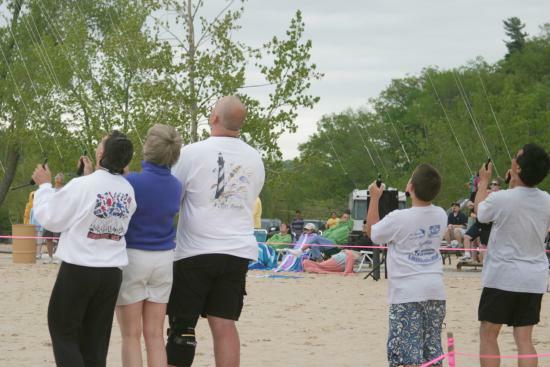 It wasn’t until he came back around that I found out that even his kite survived the crash. We decided that we had already tempted the fates enough for one day, so we found other things to do before our luck ran out. 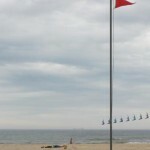 Before the bad weather started again late that afternoon, kites were everywhere. 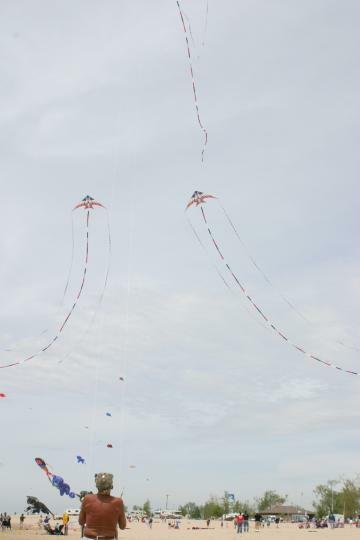 David Gomberg, whom we had the pleasure of meeting earlier in the weekend, had us try tugging the line of the kites he had up. Hmmm, that’s not as bad as I thought. “That’s the pilot; try the other line,” David said. Wow, I couldn’t even pull slack in it with my bare hands! 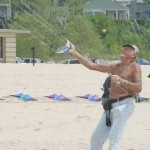 I was able to see Ray Bethell flying 3 kites. I had seen pictures and read descriptions of his flying, but I still couldn’t visualize how a person could fly a kite from their waist. Well, to my amazement, I’ve seen how it was done, but I still don’t understand how he made it zip around so smoothly. It reminded me of watching a magician–you see the trick done, but you can’t understand how. 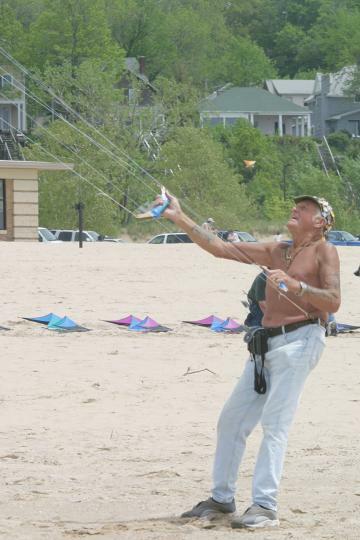 I’ve been wondering what made him start flying a kite from the waist. Perhaps I’ll see him again sometime to ask. Near Ray was a guy setting up a 12-stack. He went up and back down. After a repair we saw him move closer to the shoreline. 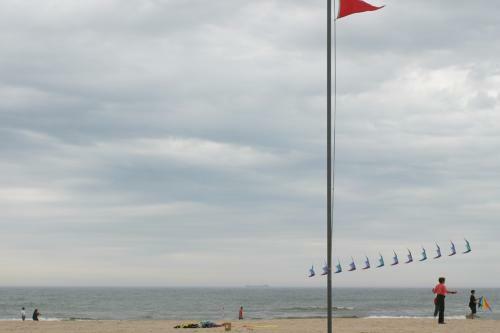 Behind the park’s high wind warning flag, we saw his stack take flight. 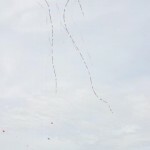 I was surprised how quiet that many kites were in flight. 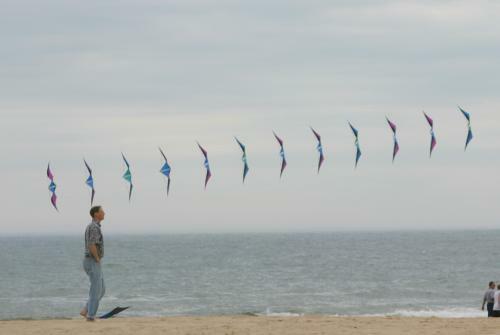 Jay and I met up with one of the kite-boarders. We started sharing kite and weather stories and learning things about each others kites. 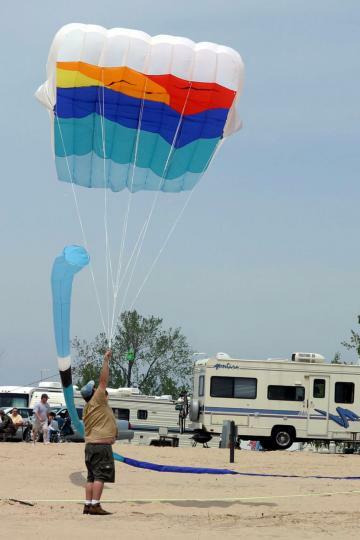 I mentioned I have been curious about power kites, and he offered to give us a try on one of his kites. It was the first foil I ever had in my hands. 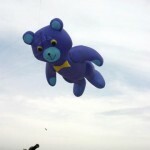 I was surprised how much more forgiving the control was than a stunt kite. The feel in the ‘power zone’ was exhilarating. 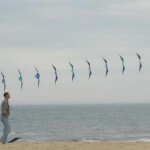 He made a convert out of me; a power kite will be my next purchase. It can’t replace my tricking, but it’s an excellent alternative. I hung around there for a while while I watched the boarders get out their gear and hit the water. I headed back to take in some more demos. The last I saw was a group of people flying together for the first time (Lee and Sue Sedgwick, Sam Ritter, Lam Hoac, and Zach Gordon). They were amazing with their revolutions. I couldn’t help but think what a mess 20 lines would look like in unskilled hands. As they were finishing, the weather turned bad again. Shifty wind and rain were driving many people away. This entry was posted in 2004, Events / Festivals, Issue 37 (Jul/Aug), KL Archive, Reports and tagged festival, great lakes, Michigan.